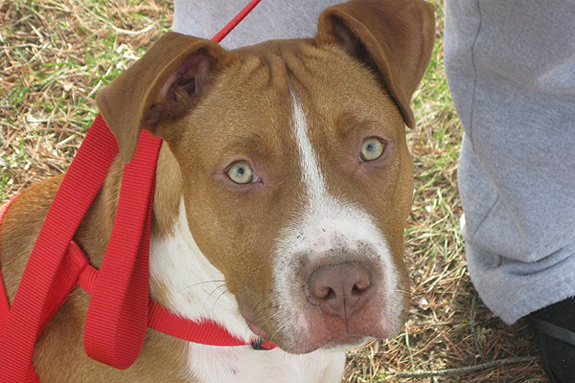 I signed my rescued young pit bull Krusher up for obedience class. 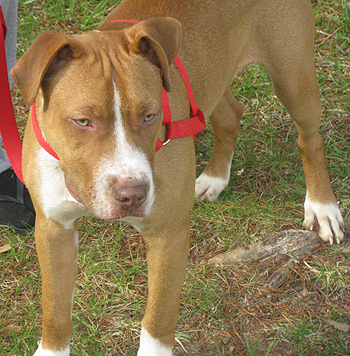 On the first day, the instructor said she didn’t know what to expect from him because he was pit bull. Krusher showed her what to expect. Krusher was obedient (something he isn’t at home all the time), calm, confident and eager to please! In the class there were three German Shepherds, a Beagle mix, another dog (not sure what he was), an Alaskan Malamute and Krusher (the only pit bull). All of the participants were puppies ranging from 3 months to 1 year old. The instructor was good and provided numerous tips for various issues from mouthing to how to gaining confidence. The class was six weeks long and many of the puppies were insecure with the exception of Krusher and one German Shepherd. The other puppies were whiney and distracted during class. Krusher was used to demonstrate in many of the exercises (I am still smiling), and he was the life of the class. At the end of the third week, people started coming closer to him, watching him and trying to get their puppies to emulate his behavior. The instructor was so impressed with Krusher that she asked if we were interested in an obedience training competition. I had never heard of it but asked for more information. I’m not sure who was soaking it more: the dog or me. At the end of class that day, as I was getting in my car, a young lady came to me to compliment Krusher again. She mentioned that everyone in her family was scared of pit bulls. I could tell she wanted to pet him, so I rolled the window down and we continued to talk. She eventually pet him, and he stuck his head out of the window further as if to reassure her that he wouldn’t bite. The young woman complimented me on the way I handle him and said that if more people would take the necessary steps to train their pit bulls, maybe people’s perceptions would change. Of course I informed her that there are many pit bull/bully breed guardians who do train their pets. However, it is those few bad apples that make it bad for the good ones. There were several times during the conversation where she mentioned seeing Krusher in action has definitely changed her opinion about pit bulls. I thanked her and told her to spread the good news about her encounter with a pit bull! For more of Krusher’s tales, follow Kelli, The Pretty Chic with the Pits, Inc., on Facebook and Twitter. :’-) tears of Joy! Exactly what we need to be doing. 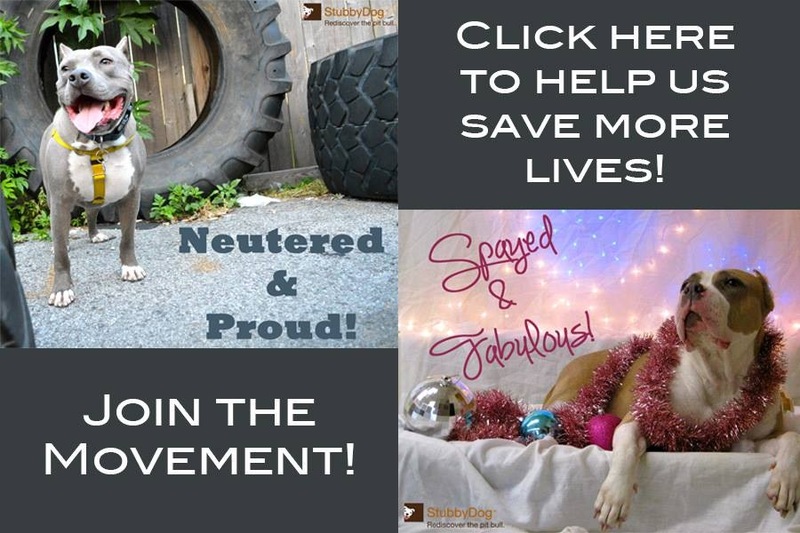 Spreading the word about Pit Bulls like the gospel. People will only understand what the see so lets show them! Great story ..I love my pits to death. I just wish that people would chose names that fight the stereotype rather than feed into it. I have rescued pits named Chompers, Killer. It is a small thing but every little bit helps!! When my family adopted Krusher we didn’t like his name “Bones”. 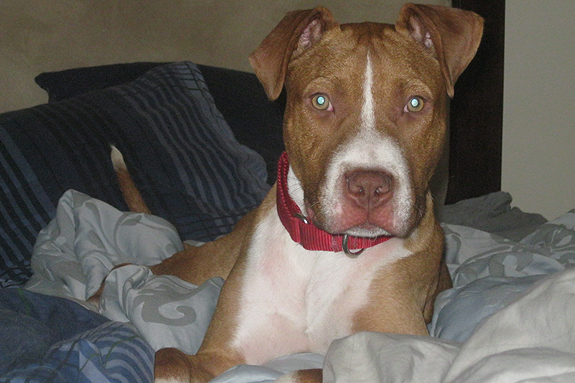 Krushers’ original name was Tyson (on his adoption papers) however, his originial owners abandoned him at three months old, in the dead of winter (January 2010). 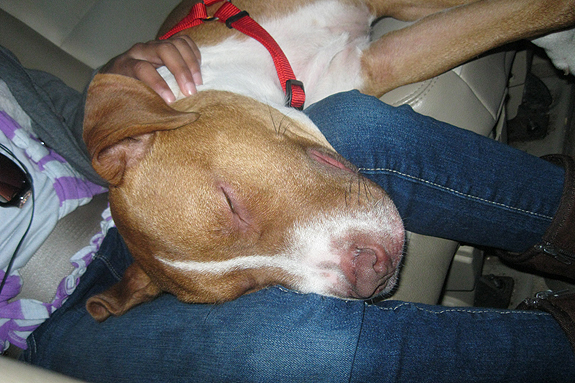 The tied him to the front porch and left him and for two weeks people walked, ran and drove by him. Finally, when he was bought into the shelter he was nothing but fur and bones. The staff at the shelter renamed him bones. After we adopoted Krusher at the tender age of 5 months he chewed and crushed my very expensive shoe collection (he only went for the expensive platform, which is all I wear); so my son decided to add on crusher. Considering Krusher is apart of the family as I did with my kids they have a part of me so I chose to spell his name with a “K” instead of a “C” and the kids added their spice as well. Krushers’ name is well deserved. @skreidle The staff is extremely knowledgeable and it’s a nice facility. Krusher and Sasha will be attending their flyball class soon.